Here’s the clip depicting Amazon’s tablet being subjected to a barrage of durability tests in an industrial tumbler. 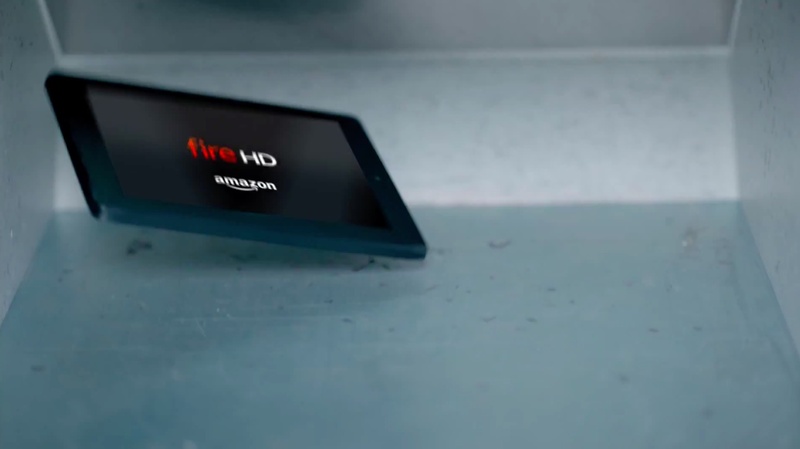 According to Amazon, Fire HD tablets undergo over 25 durability tests and are designed to withstand forces of 1,000 g’s. “When tested against iPad mini 3 in drop tests and tumble tests, Fire HD proved 2x more durable,” argues the online retailer. Apple’s iPad Air promotional video also shows the device undergoing various stress tests, with Jony Ive arguing that “with less mass the iPad Air retains its structural rigidity,” as seen below. “This integrity, this durability inspires confidence in a product that’s meant to be taken places, handled and really used,” Ive says in the Apple video. The Kindle Fire HD starts at $99 for a six-inch edition. A version with a seven-inch display is an extra $40. The Fire HD is the official tablet of the NCAA.